FA-300CE, Guitar Package from Fender. The new Fender FA-300CE pack features an acoustic electric guitar, the Slide portable audio interface and iOS apps. 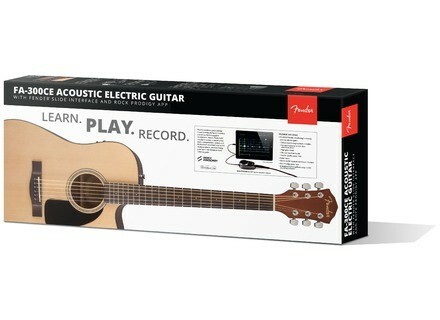 For under $450, the Fender FA-300CE Acoustic Slide Pack allows beginners to learn how to play the guitar with a dreadnought acoustic-electric guitar that they will connect to their computer or iPad via the Fender Slide portable audio interface and follow the Rock Prodigy guitar learning app lessons. They can also use amp and effect models from the IK Multimedia AmpliTube app included. The Fender FA-300CE Acoustic Slide Pack is available with a US price of $449.99. More info at www.fender.com. A video journey through the Taylor Guitars factory complex Audiofanzine recently visited the Taylor Guitars complex in El Cajon, California, and we shot a lot of footage during a tour of the factory. We put together this video to give you an up close look at Taylor's guitar building process. Kleissonic, German boutique effect manufacturer Let’s finish the week in Berlin where you can discover or rediscover Kleissonic, a boutique effect pedal manufacturer. Way Huge introduces the Saucy Box The new Way Huge effect pedal will turn on the juice of your guitar, wether you need a clean boost or a dirty overdrive.